The ToolCell XT Automatic Toolchanging Press Brake from LVD Strippit has a total length of tools with 17,280 mm maximum punches and 40,320 mm maximum dies. The system consists of two laser cameras and Touch-B control. The system’s measuring device transmits digital information in real time to CNC control for subsequent adjustment of the depth to obtain correct angle. The ToolCell XT provides intuitive graphical icons to manage parameters of the machine and is available in 135 ton/ 4 meter configuration. Akron, NY, November 1, 2018 – LVD Strippit launches ToolCell XT, the latest generation of its ToolCell automatic tool changing press brake with extended capacity to hold 50 percent more tooling than the original design. ToolCell XT is the solution to efficiently bend small batch – high mix parts with high accuracy and with minimal changeover time. The large capacity of tools housed within the press brake provides the flexibility to handle a wider range of bending jobs, including complex layouts. ToolCell XT made its debut at EuroBLECH. ToolCell XT performs tool changes quickly and precisely following an optimized tool change path. Automated tooling setup improves the efficiency of bending operations and eliminates time-consuming manual tooling adjustments. With its extended tooling capacity, ToolCell XT offers the versatility to handle varying material types, organize tooling by material type, easily switch between stainless steel and mild steel applications. 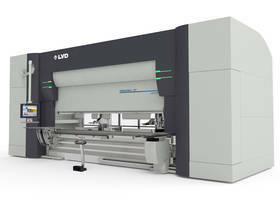 LVD is a leading manufacturer of sheet metal/plate working equipment, including laser cutting systems, punch presses, press brakes, guillotine shears and mid-level automation systems, integrated to and supported by its CADMAN® software suite. LVD Industry 4.0-ready products and technology make smart manufacturing possible.